Working overtime on weekends is not my cup of tea! Coffee is not my cup of tea! Why should we learn idioms? 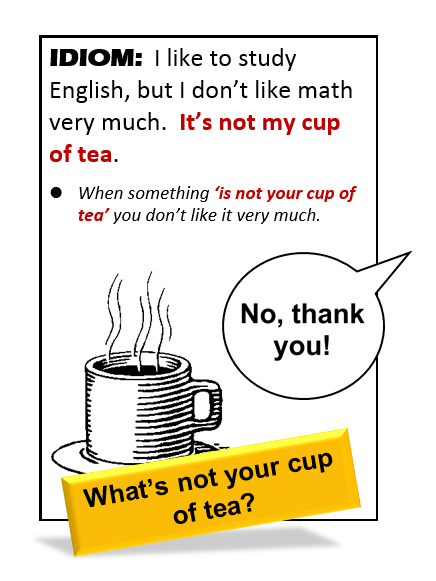 First, idioms are a natural part of language - all English language learners use idioms in their own language. For example, one idiom I've learned in Mandarin is, "Yi fen chian, yi fen huo" which directly translates into, "One piece of money, one piece of merchandise." The English equivalent is, "You get what you pay for." Second, learners don't necessarily have to use many idioms in their own communication, but they do have to understand them in order to fully understand English. Idioms are an essential part of English. Third, idioms are fun to learn and allow us to describe situations in creative, interesting ways.